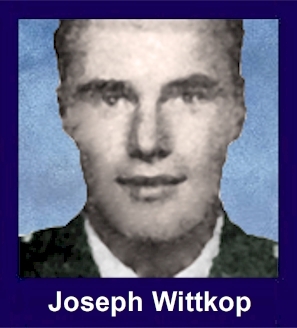 The 35th Infantry Regiment Association salutes our fallen brother, PFC Joe Allen Wittkop, who died in the service of his country on April 5th, 1968 in Kontum Province, Vietnam. The cause of death was listed as Small Arms/AW. At the time of his death Joe was 19 years of age. He was from Duluth, Minnesota. Joe is honored on the Vietnam Veterans Memorial at Panel 48E, Line 22. The decorations earned by PFC Joe Allen Wittkop include: the Combat Infantryman Badge, the Bronze Star, the Purple Heart, the National Defense Service Medal, the Vietnam Service Medal, the Vietnam Campaign Medal and the Vietnam Cross of Gallantry with Palm Unit Citation. Joe was a friend growing up around Franklin School. We were in the same classes together at Washington Junior High. Always smiling and laughing, you made us feel good. Thank you Joe, for your service and sacrifice. Rest In Peace Joe - you left us too early. Joe's father was a WWII prisoner of war in the Pacific and participated in the Bataan Death March. His father and mine were close friends. My thoughts are with the his brothers and sisters and hope they are well. Joe was a good man, but I knew him as a boy growing up on Duluth's Central Hillside. He had a wonderful sense of humor and the seeds that would have made a good husband and father. God bless his memory on this sunny day in 2002.